The campus community has reduced its waste in recent months with the help of new compost and recycling bins. Since the new bins were introduced in September, the campus has doubled its composting rate and increased the recycling rate by ten percent. 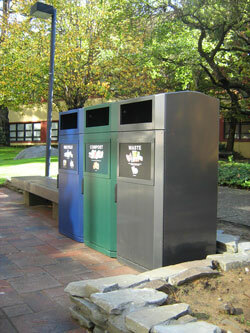 The new recycling and compost bins have been installed at 120 locations throughout campus, shown here near Burk hall. "It's a wonderful result, especially to see composting doubling so quickly," said Sustainability Programs Manager Caitlin Steele. "The waste diversion we've measured is far above what we expected with the new bin system." The bins were installed at 120 locations throughout campus, and provide disposal for compost, recycling and waste materials. The metal bins and new signage replace older concrete bins and provide campus-wide composting for the first time. The campus currently diverts 76 percent of its waste away from landfills. The bins are designed to help the campus reach the larger goal of reducing its waste to zero by 2020, meaning that all materials will be reused, recycled or composted rather than sent to a landfill. "For the last five years now, we've hovered around 75 percent waste diversion," said Steele. "We want to reach 80 percent in the next few years, and these bins should help in getting us there." Old concrete bins have been painted and turned into planters. "Some people may still be confused about how to sort their trash," said Steele. Campus sustainability officers plan to educate people on which common items -- food wrappers, bottles, coffee cups and lids -- are compostable or recyclable. "We realize that knowing what is compostable can be confusing at first, and this spring semester we're going to focus on educating people on how to take full advantage of composting," said Steele, who expects the new bins to divert even more waste once people become familiar with them. The project was funded by the University and organized by the Housing and Physical Planning and Development departments as well as the Cesar Chavez Student Center. 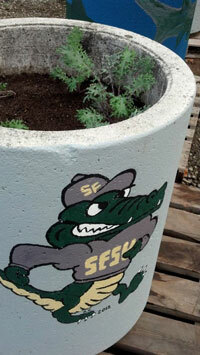 In the spirit of reusing, the old concrete bins have been repainted, filled with soil and converted into planters by sustainability staff and students.